Based on her popular Instagram @Hatecopy and her experience in a South Asian immigrant family, artist Maria Qamar has created a humorous, illustrated “survival guide” to deal with overbearing “Aunties,” whether they’re family members, annoying neighbors, or just some random ladies throwing black magic your way. We’ve all experienced interference from our Aunties—they are at family parties and friendly get-togethers, finding ways to make your life difficult, trying to get you to marry their sons, and telling you to lose weight while simultaneously feeding you a second dinner—and it has stunted our social growth and embarrassed us in front of our friends and cool cousins for years. This tongue-in-cheek guide is full of advice designed to help you manage Aunty meddling and encourages you to pursue your passions—from someone who has been through it all. Qamar confesses to throwing sweatshirts over crop-tops to get out of the house without being questioned, hiding her boyfriend in a closet, and enduring overbearing parents endless pressuring her to become a doctor, lawyer, or engineer. Holding onto your cultural identity is tough. Always interfering Aunties make it even harder. But ultimately, Aunties keep our lives interesting. 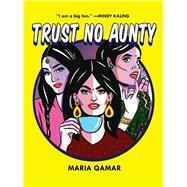 As an Aunty-survivor and a woman who has lived the cross-cultural experience, Qamar defied the advice of her aunties almost every step of the way, and she is here to remind you: Trust No Aunty.